2010-2013, supported by a USDA grant and involving collaboration of Washington State University’s Center for Sustaining Agriculture and Natural Resources (CSANR) with six selected focus farms in Washington State. Project leader: Dr. Lynne Carpenter-Boggs. This project addresses needs of 3 stakeholder groups: organic producers, organic certifying agents and agencies, and purchasers/traders of carbon credits. These groups need a scientifically sound yet simple estimation of the carbon and nitrogen sequestration and net greenhouse gas (GHG) balance likely in a given organic cropping system scenario. Read more. On S&S Homestead Farm, access to water for animals, orchard and crop irrigation is alimiting factor. Rain catchment system collects water from two barn roofs, and funnels excess water to a cistern that overflows into open swales to a fenced pond with a holding capacity of approximately 750,000 gallons. • 10,000 sq. feet of row crops next to the pond, where each row is supplied by a valve-controlled underground drip line (the row crops will eventually be extended to 2 acres). 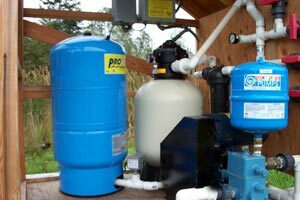 The system came on line in July 2004 during a 3-month summer drought, saving about 40,000 gallons of well water per month. The plants responded favorably (increased vigor and productivity) to irrigation with soft rainwater instead of hard groundwater. Read more. The number of small farms on Lopez Island has increased in response to a desire for local food security. Many farmers raise grass-fed livestock, increasing the demand for farm-produced hay and forage. To compensate for the low availability of nutrients in the island’s acidic soils, farmers periodically apply lime, which is expensive to transport and apply and oxidizes organic matter. Lopez Island farmer Henning Sehmsdorf has applied compost and mulch to heal acid soil, but his supplies of those materials are limited. In this project, Sehmsdorf and Washington State University agronomist Steve Fransen tested to see whether biological stimulant materials can be created on the farm as economically and ecologically viable alternatives to liming. They compared liming, biological stimulants and no treatment on a 1-acre plot, assessing the effects on soil characteristics and forage yield and quality, concluding that biodynamic preparations performed at least as well as the lime application, if not better. “If final analysis bears this out, we will have achieved our goal, which is to maximize protein production in the form of harvestable forage, meat and dairy products,” says Henning Sehmsdorf. “That will increase overall farm production while maintaining ecological balance by reducing the consumption of nonrenewable fossil fuels and other resources.” Read more. • An island donor contributed a large hoophouse now installed on S&S Homestead Farm for instruction and vegetable production for the school cafeteria. • The school board officially sanctioned the farm-to-school project in support of the state mandated Wellness Policy. • The school cafeteria committed to maximize access to locally grown, organic food (within current school budget limits), and the chef and kitchen staff have undergone extensive training to redirect the delivery of school lunch. Read more. This study looked at the technical and economic feasibility of growing organic grain, in this case barley, on small acreage. It was the first organic grain to be grown in the San Juan Islands. The idea was to find a crop that could capture and recycle excess soil nutrients from a field used for wintering beef cows, preventing pollution and reducing farm inputs. As a result of the project, the farm saves money to buy straw it uses to mulch fruits and vegetables (it typically costs $7 a bale from the local feed store). The grain fed to cattle, sheep, pigs and chickens promotes their health by guaranteeing a clean, organic feed source. And the barley takes up nutrients that otherwise might pollute ground or surface waters. As a result of this research, other local farmers have begun to experiment with growing winter wheat, oats and barley using methods similar to those demonstrated in this project. S&S Homestead Farm aims to produce 2 tons of organic barley a year in rotation with soil-building crops to supply the farm with animal feed for up to two years. “With the production of both barley and alfalfa-oat hay, in addition to summer forage, S&S Homestead Farm will have accomplished its larger goal of self-sufficiency in producing organic, additive-free feed for all its animals sustainably,” says Henning Sehmsdorf. For more information on all three grants from SARE, please visit the SARE website.